This Beach Front Condo #108 is a very kid friendly place with lots of games, puzzles, etc. There is a wood burning fireplace(presto logs only) in the unit perfect for snuggling in front of when the winter storms come through. The living room also has a 50" Smart TV for those sports fans and movie watchers and a hide a bed couch. 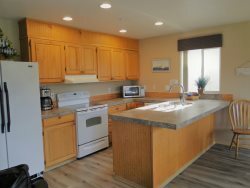 This unit is located on the main floor with a view of the green belt/picnic area. A safe place for the kids to run free. NO smoking and NO pets. No smoking on balconies. Our check-in was very easy and handled well. The unit was very comfortable. Much better than a hotel room. We loved the fireplace and the big screen tv. It felt like we were house sitting for a friend. The team members were very nice. We arrived early, and since the condo was ready, we got the keys early. This was nice so we could unload the car before we went on our adventures. The condo was just perfect. Great location and very clean. Set up super cute as well. Loved the back deck and watching the deer in the morning. We only really were at the condo in the mornings and evening, we were enjoying the town and beach throughout the day. Was perfect. Work issues required that I change the initial days we reserved. The team was very accommodating and communicated back quickly. Thank you! We have 4 year old twins and the property had everything we needed. The kitchen was well stocked and even had toddler friendly plates and bowls. We forgot ours which saved us from having to buy some. Great room and very relaxing. Thank you! Lovely and cozy little beach condo with a full kitchen and easy access to town and the beach- loved it! Very easy check in process. The key was waiting for us when we walked in the door! Nice condo! Everything we needed for a great weekend! Check in was smooth and easy. The lady that checked us in was super polite and friendly. Loved staying at the Nautilus! Room 108 was adorable and cozy. My family had a great time in Ocean Shores and we will definitely be back to the Nautilus! Very clean. Well-appointed kitchen. Lovely decor. Very comfortable.